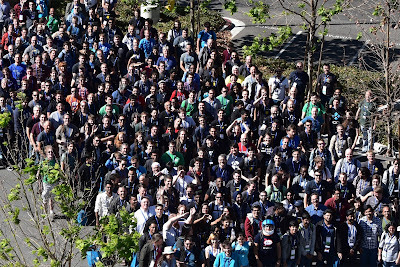 This year Google brought over 320 mentors from all over the world (33 countries!) to Google's offices in Sunnyvale, California for the 2017 Google Summer of Code Mentor Summit. This year 149 organizations were represented, which provided the perfect opportunity to meet like-minded open source enthusiasts and discuss ways to make open source better and more sustainable. Group photo by Dmitry Levin used under a CC BY-SA 4.0 license. The Mentor Summit is run as an unconference in which attendees create and join sessions based on their interests. “I liked the unconference sessions, that they were casual and discussion based and I got a lot out of them. It was the place I connected with the most people,” said Cassie Tarakajian, attending on behalf of the Processing Foundation. We've held the Mentor Summit for the past 10+ years as a way to meet some of the thousands of mentors whose generous work for the students makes the program successful, and to give some of them and the projects they represent a chance to meet. This year was their first Mentor Summit for 52% of the attendees, giving us a lot of fresh perspectives to learn from! You can browse the event website and read through some of the session notes that attendees took to learn a bit more about this year’s Mentor Summit. Now that Google Summer of Code 2017 and the Mentor Summit have come to a close, our team is busy gearing up for the 2018 program. We hope to see you then!